Mother Nature is starting to give me whiplash from the sudden changing of warm days to really cold days as cold fronts keep coming in. In spite of what it feels like around here in the northern Bay Area, spring is around the corner and we're definitely seeing more spring collections launching or about to launch. 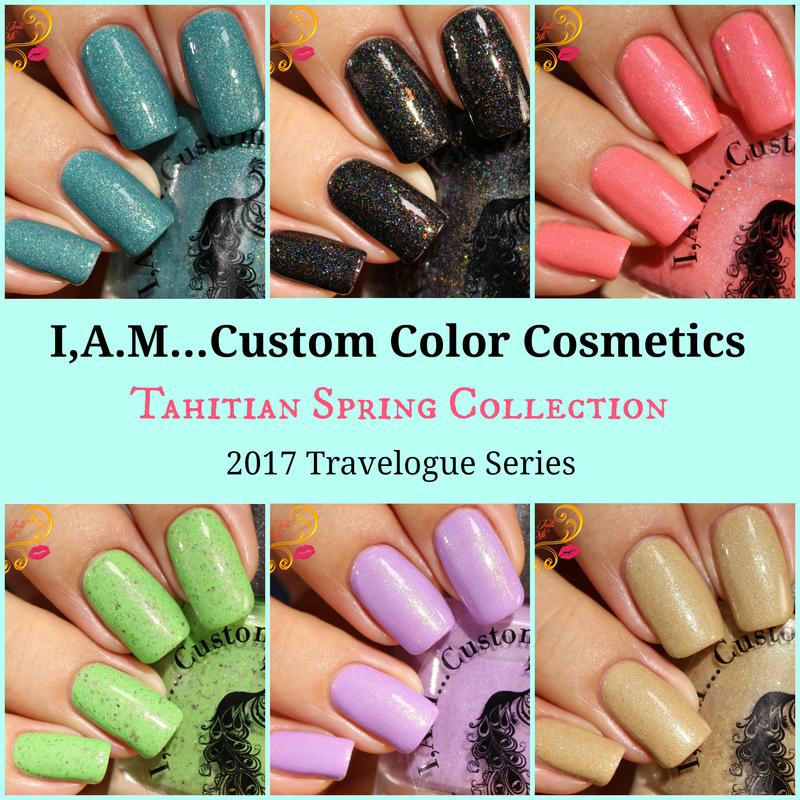 For today's blog post, I have the new Tahitian Spring Collection by I,A.M...Custom Color Cosmetics (IAMCCC) to share with you. has been releasing themed series with the focus of 2016 being on mythology. Each collection has focused on a specific aspect within the series, and we're going to be seeing a similar idea this year. 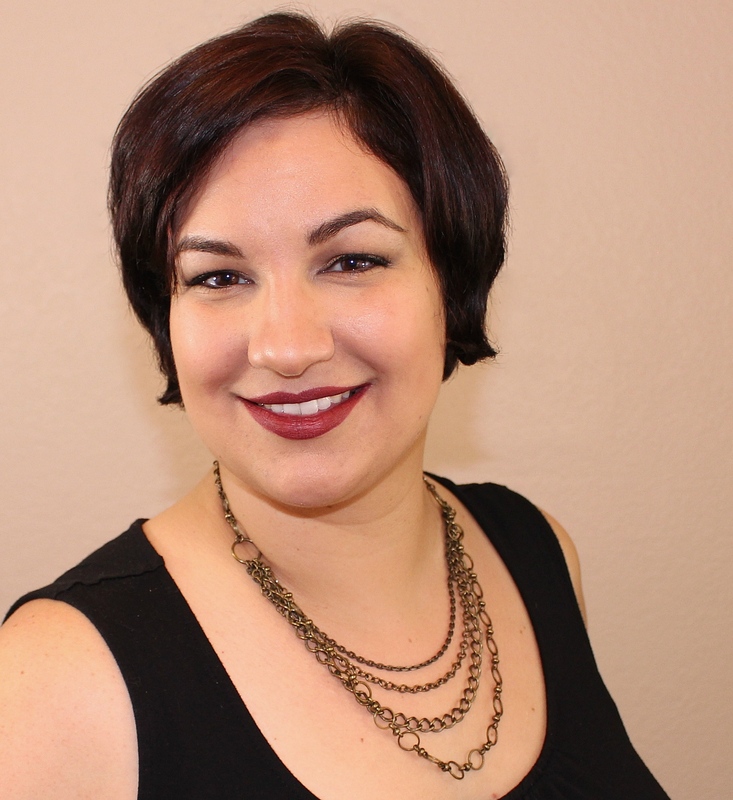 For 2017, IAMCCC is going to be doing the Travelogue Series with each collection specifically based on different locations that creator Ashlie has visited. Spring marks the launch of the Travelogue Series, specifically with the Tahitian Spring Collection. I actually had the pleasure of visiting Tahiti myself almost six years ago for my honeymoon, and it was nice having a revisit through this collection. Let's jump in a check out each of the six shades in further detail! A punchy pink leaning coral scattered holo with tons of gold, purple and blue shimmers, flakies and flecks. So many tropical drinks originated from French Polynesian fruits and rum! Best thing was a good drink and sitting on the balconey watching the sunset. Gorgeous shades of purples and oranges, corals, reds and pinks. Breathtaking! What better way to start out this collection! The original color, Tahiti Sauce, was created as an event custom for the Colors and Cocktails event at last summer's blogger/maker event in Las Vegas and was inspired by one of Ashlie's sunset photos from her visit to Tahiti. The original colour was beautiful, and I'm sure many are thrilled to see a similar version available for purchase by everyone. The formula is really nice and easy to work with, and I'm willing to bet this is worn on my toes a lot this summer! Here is a handy comparison to see how the original Tahiti Sauce compares with Tahitian Sauce. Tahiti Sauce is a little darker, but Tahitian Sauce is really close! A black ultra holo with blue, green, purple, and pink UCC flakies and blue green shifting shimmer. French is the national language of Tahiti, Tahitian is just now making its way into modern culture, many songs, while in French, Tahitian and English; French is still the dominant language. Perle Noire means Black Perle in French. Part of what brought empire after empire to the tropical South Pacific are these rare and gorgeous black pearls that have colors, shapes and quality unlike anywhere in the world. The warm nutritious waters are just right to cultivate one of the most prized gems in the world! So naturally I had to grab a few, one of course being a peacock variety! While I don't consider myself a pearl fan overall, I was smitten by the bowls and bowls of black pearls I found during my own visit and picked up a few myself! While finding these beauties are pretty rare in the US, and with a rather hefty pricetag, they can easily be found on the islands at a surprisingly affordable price. As for the polish, Peacock Perle Noire is a fun interpretation of the inspiration. IAMCCC could have easily released a multichrome that would fit the black pearls, but I'm actually partial to this approach. The colour is fabulous and the formula is pretty easy to work with. The formula is a little on the thinner side to help show off the flakies nicely, but I had no issues with flooding and only two coats were needed for opacity. This lavender creme with contrasting green shimmer is the perfect spring color. While many of the types of Hibiscus in Tahiti are not native, they have hundreds of varieties. I love Hibiscus, and I love pressing them from the places I find them! I love hibiscus flowers as well and have a plant here that I am dying to see bloom soon! Sadly my other plant, with my favorite colours, did not survive this winter, and I'm trying to track down the variety. Hibiscus flowers are so beautiful and delicate in general, but the lavender varieties just seem even more so. 100's of Hibiscus has an amazing formula, and the green shimmer is more obvious in real life than in these photos. The colour does seem a little sheer with the application of the first coat, so much so that I initially expected it to be a three-coater, but I was pleasantly surprised to see that two was plenty for me. If you have the tendency to paint with ultra-thin coats or have really long nails, you may find you need a third coat. A beige scattered holo with contrasting blue flecks and shimmer, gold, silver and blue micro flakies. This color reminds me of where the water hits the coral sands. The water is so clear that you see everything. Please ignore that this colour is sadly not the most flattering on me and focus on how pretty it is! I really feel like I have sand on my nails when I look at this polish, without the added texture, of course. It's a nice neutral shade for when you don't want to sport something bright or just need a palette cleanser, so to speak. I found the formula of Matira Pointe to be thicker than the rest of the polishes in this collection, but I still found it easy to work with. I personally prefer thicker polishes so this worked perfectly for me, but if you prefer a thinner formula, you may need to add a few drops of thinner. Matira Pointe is also densely pigmented and just barely missed being a one-coater for me. If you use just slightly thicker coats than me or have shorter nails, you'll likely find you only need one coat with careful application. Maka is Tahitian for cannabis. With my home state legalizing recreational use this year, I felt it was a perfect way to honor that, with a gorgeous bud green holo polish with contrasting purple shimmer and UCC flakies. Whether you want to "Legalize it!" or not, this polish is a must! The weather and soil makes for the perfect growing conditions. In Bora Bora it is a local fave, so to Maka! Maka is NOT neon green, and while my photos are not actually this bright, they are looking much brighter with uploading onto my blog. The formula is fantastic though and very densely pigmented. It was so close to being a one coater for me so if you have shorter nails, one coat will likely suffice. A deep teal to aqua turquoise holo thermal with tons of green shimmer, flakies and flecks. The Belvedere Outlook is up on a mountainside in the heart of Moorea, overlooking tons of lush greenery, a craggy left over from the volcano and both Cook's Bay and Opanoha Bay where Cook actually came into the island. Moorea is the island neighboring Tahiti, and it is easy to visit the island with a relatively short ferry trip. With the both thermal shades being colours I love, The Belvedere is arguably my favorite shade from this collection. The formula is fabulous to boot and the final effect with all the shimmer, flakies, and flecks is pretty spectacular! The first photos, shown above this text, is what The Belvedere looks like on me most of the time. I tend to throw out a lot of heat, so thermals generally stay in the warm state with the tips in the cooler state with enough overhang. You can see a little bit of the cooler state in the closeup photo on my nail tip. After dipping the tips of my nails in ice water, you can see the transition better here. My apologies for the extra water as taking the extra few seconds to fully dry my nails heated the polish too quickly and changed the colour quickly. The two states are definitely different from each other. It's not as striking a change as you get with completely unrelated shades, but this will likely appeal to those that like turquoises and teals. I tend to shy away from thermals since I often only like one temperature state, so this is perfect for those that feel similarly! Here is another closeup after another dipping series- first in warm water to make sure I had the lightest aqua version and then an ice dip for my tips. This thermal is fun to play with although it seems as though the cold state requires a rather low temperature in order to get the colour change. The Tahitian Spring Collection is now available for purchase from I,A.M...Custom Color Cosmetics here. The Tahitian Spring Collection was a great launch of the Travelogue Series, and I enjoyed revisiting some of the highlights from my trip through these polishes! Do you have a favorite shade from this collection? What destinations would you love the see inspire a polish collection? I'd love to hear from you! Peacock Perle Noir is calling my name so is Tahiti Sauce. This is a gorgeous range of colors for sure! I like the idea behind the collection. Beautiful swatches Jen! These are all beautiful but my favorite is Peacock Perle Noire. Tahiti Sauce is one I'd pick too and I rarely pick this sort of shade. Beautiful! I especially like the black one. While I don't typically care for thermals, the Belvedere is easily my favorite polish here. The range of blue is something that I can see myself easily wearing in spring and transitioning into summer! All the nail polishes swatched beautiful -- I like all of them! So many new nail polish brands I'm learning about these days! My list is getting sooo long! The Belvedere is my favorite, I can't resist a thermal! Tahiti seems beautiful, it's on my travel list! I love all the micro-flakie action going on here! These are gorgeous! Definitely spring shades! I'm not fond of the brand, but all of these are so pretty! Maka is gorgeous! What a fun collection to welcome spring. I absolutely love Maka - so unique!! I agree with the Spring whiplash lol! I am loving bright colors for this spring!